I have recently finished the score for a short film called Junana by director Chantal Bertalanffy. Spoken in mainly French, but also Japanese and a little English (plus filmed in Japan). The score takes a little influence from composers such as Joe Hisaishi, Tan Dun and Yoko Kanno, and was kept fairly minimal. This stripped back approach really identifies with the main character who is beautiful and curious, though also is yet to find a direction in life, and is young, quiet and naive. The extremely talented Lily Thornton played cello beautifully, bringing the score to life and helping us identify with the main character. It was a pleasure to help out director Ben Childs and the team for the upcoming short film The Space Trash Men. The earth is full of trash and someone has to haul it out into space. I designed all sorts of alarms, beeps and blips to give the spaceship some character. Currently the film is in post-production. Ben and the team impressively gathered together all the funds they needed through PledgeMe, and you can follow on Twitter @spacetrashmovie. I am very pleased to announce that a selection of my tracks have been added to Syncbubble. Founded by Simon Elms at Eclectic (London), Syncbubble allows you to search for tracks by tempo, genre, mood and much more, plus audition tracks against your uploaded footage and share the results. It includes a vast array of fantastic music by Eclectic, plus music by artists such as Alexandre Desplat [Kings Speech, Fantastic Mr. Fox], Cliff Martinez [Drive] and Clint Mansell [Filth]. Find out all about Syncbubble here. Shortly after completing music and sound design for the first Cycle Cities animation by the very talented Natasha Tonkin and Yeshen Venema (see below), a further two thirty second ads were commissioned. The ads are entitled Cycle Eco and Cycle Fit. The brief was simply to keep with the same style and instrumentation - Natasha had great confidence in me and gave me free reign to write what I saw fit which was fantastic. After just a couple of emails between us and a bit of tweaking to the initial sketch we had something we were both really happy with that could be refined and detailed to create what you hear. You can follow Cycle Cities on Twitter @CycleCitiesEU and also @thepandahorse, @yeshandtash. I am thrilled to have joined the team at Workhouse studios, London, assisting in arranging tracks. 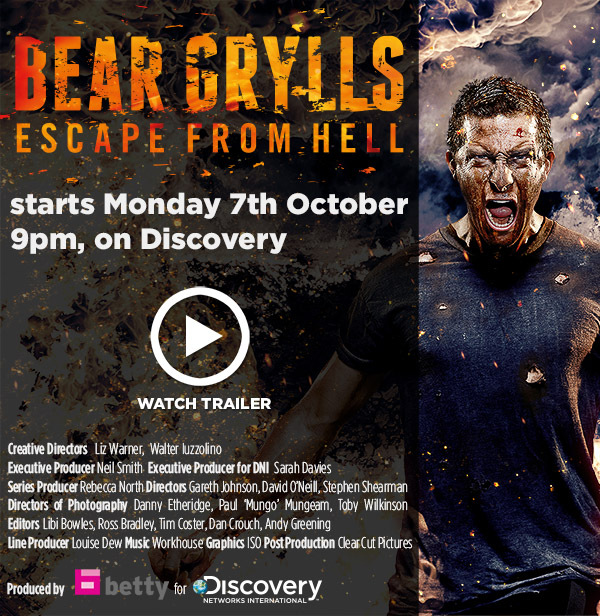 Bear Grylls has been back with his rapids swimming, cliff climbing antics in Bear Grylls: Escape From Hell on the Discovery Channel, which I have worked on, and I am currently part of the team writing music under the Workhouse umbrella for a prime time show to be broadcast on Channel 4. "With hundreds of hours of prime-time, award-winning TV behind them, Workhouse brings together some of the UK's most successful and in-demand composers. Coupled with an immense on-site pool of talent, including hit pop and dance producers, world-class musicians, programmers and orchestrators." Natasha Tonkin of Pandahorse has directed and animated this promotional video for Cycle Cities, for which I thoroughly enjoyed composing the music and creating sound design. Cycle Cities spans several cities across Europe and this was commissioned by the London Borough of Merton as a project partner to help promote the benefits of cycling rather than driving. They loved it so much they asked for two more 30 second animations, which will be online shortly. Follow on Twitter @CycleCitiesEU. This was a short film made in collaboration with AnOthermag.com and COS stores in celebration of Frame at Frieze Art Fair 2012. Music and sound design were created for this project. The split screen presents us with the world of design and fashion meeting art. I jumped at the chance to work with the Live Film Orchestra on this one. The idea of creating sound for the film without using the actual notes was a challenge, but one I was excited to take on and bring the film to life with all the "non-musical" sounds musicians make whilst playing. It presents a striking message - what would film be without music? A short animation by Amber Gao and her team which was commissioned by the London Transport Museum. Music by Charles Mauleverer and sound design by myself. Really great fun to work in that cartoon context and it went down very well at the Museum in 2012.